Digits: they're not just 0 and 1 anymore. For Neil Rolnick's second outing on Innova, he has once again surrounded himself with some of the best performers of new music, and integrated their musicality with the world of digital sampling and processing. Pianist Kathleen Supové takes her own digits, as well as those of the computer, on a wild ride in the title track. Peter Eldridge, of the a cappella jazz group New York Voices, delivers a heartfelt rendition of Making Light Of It, Rolnick's setting of six poems by Philip Levine. The Paul Dresher Ensemble's Electro-Acoustic Band takes a virtuoso romp through Bush era politics, in Plays Well With Others. And Rolnick himself revisits one of his signature pieces from the 1980s, A Robert Johnson Sampler. These digits don't just count, they sing. Substantial work worthy of repeated listening. The clang of loud dissonant piano chords got you down? 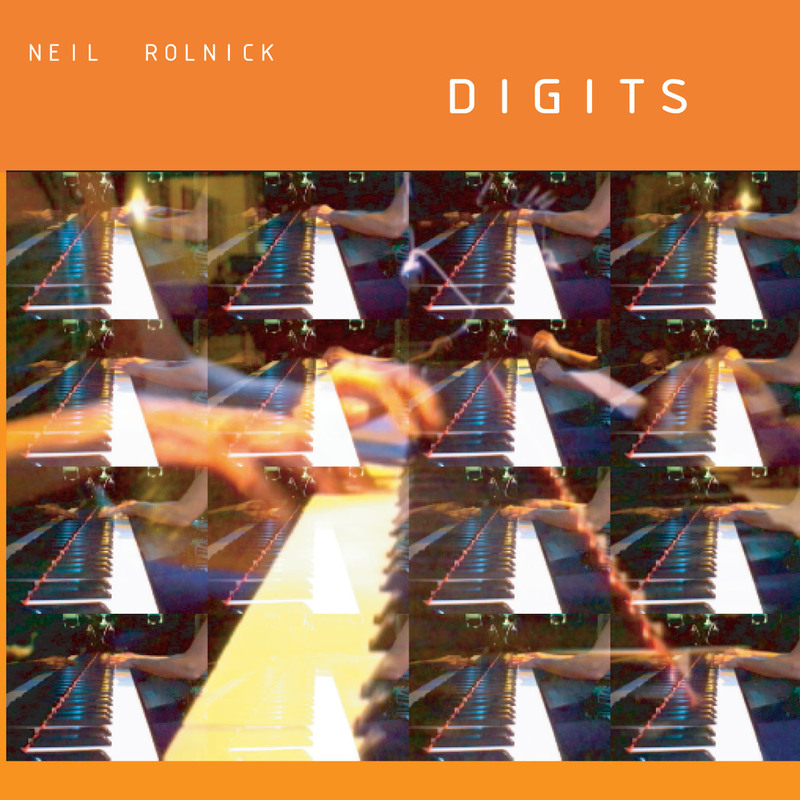 Throw on the title track of Neil Rolnick's latest CD Digits. Sure, pianist Kathleen Supové pounds out some noisy chords, but you would never find these tuneful sonorities in a Boulez sonata. With the addition of digital delay and computer processing, things get a little dizzy, but this 11-minute tour de force won't leave you with a hangover. THE four recent works by Neil Rolnick on this disc draw on the oversize gestures of Liszt’s piano music, the introspective figuration of Robert Johnson’s blues guitar, song forms and avant-garde theater. That’s a broad expanse, but the thumbprint that runs through these scores is Mr. Rolnick’s manipulation of timbre and gesture. Much of that manipulation involves computers, but Mr. Rolnick is reluctant to give electronic sound the full spotlight. Most of his works are for live players, with Mr. Rolnick at his laptop, transforming and adding to their performances. The title work, “Digits” (2005), is a superb example of the process. The piano writing, played with characteristic thunder and weight by Kathleen Supové, is dense and virtuosic in the best late-19th-century tradition. Mr. Rolnick lets the piano make its mark but then takes a chord, a phrase or a hammered rhythm and tinkers with it, turning it into a repeating loop that plays as the live piano moves on or recasting it in new timbres: as a string section for example. In a song cycle, “Making Light of It” (2005), Mr. Rolnick sets Philip Levine’s plain-spoken poetry to graceful melodies with a light-textured electronic keyboard accompaniment but keeps their accent ambiguous: they could be art songs or pop tunes, depending on how they’re sung. Pete Eldridge, whose voice has a Tom Waits gruffness, offers the pop perspective, and there are moments when the music sounds like “Smile”-era Brian Wilson. “A Robert Johnson Sampler” (1987, revised 2005) creates a contrapuntal fabric from fragments of Johnson’s 1930’s recordings, sometimes heard straight, sometimes heavily modified before computer timbres replace them entirely (at least until the blues recordings return at the end). And “Plays Well With Others” (2004) is a spirited jazz-rock ensemble piece, built around an alternately amusing and heavy-handed catalog of grievances against the Bush administration. Pinning down Neil Rolnick to one identifiable musical identity is risky, since he is one of the most versatile of contemporary composers: he freely slips in and out of moods and methods, often with surprising virtuosity and wit, though without overt pastiches or parodies. Instead, the eclectic Rolnick has brought together many elements, most often borrowed from minimalism, popular music, electronics, or performance art, and fashioned them into distinctive essays that stand up quite well on their own without conforming to any single approach. Perhaps this is why Digits (2005), a dazzling computer-modified keyboard work performed with abundant energy by pianist Kathleen Supové, can be followed on this 2006 Innova release by Making Light of It (2005), a setting of Philip Levine's poetry sung with laconic mildness by Peter Eldridge against a twittering electronic accompaniment. Or why A Robert Johnson Sampler (1987, rev. 2005), Rolnick's quirky manipulation of taped excerpts from the blues master's recordings, can be followed by Plays Well with Others (2004), a tour de force in which trenchant political commentary is served up in a surrealistic sonic stew for the Paul Dresher Ensemble's Electro-Acoustic Band. Yet if Rolnick's music is understood in a larger context -- perhaps with his clever 2005 album Shadow Quartet -- his acute intelligence and engaging personality appear to be the true unifying forces in his work, rather than any pet theories or kitschy trademarks. The hobgoblins of consistency have no place in Rolnick's extremely varied output, and this keeps his music fresh, interesting, and vital, if not safe, predictable, or easy to pigeonhole. Innova's audio reproduction is exceptional throughout. The title of the Neil Rolnick piece that lends its name to this collection winks in acknowledgement of the composer’s methodology. Digits, composed in 2005, refers to the fingers of the piano soloist, as well as the zeros and ones that animate the computer with which Rolnick manipulates that pianist’s sounds. Here, Kathleen Supové produces a torrent of virtuosic gestures; Rolnick’s computer echoes and multiplies certain notes and phrases, producing an ivory current that whips and swirls around the performer. Supové has long specialized in playing such enhanced compositions, and Digits is one of the most effective items in her repertoire. Making Light of It (2005), a cycle of six songs based on poems by Philip Levine, surrounds New York Voices singer Peter Eldridge’s handsome, unaffected delivery with chiming electronic keyboards, in memorable melodies by turns radiant and melancholy. A new revision of A Robert Johnson Sampler, originally created in 1987, spins samples of the Delta-blues guitarist’s licks into a dizzying, twangy vortex. Audacious in an altogether different way is Plays Well with Others (2004), an improvisational ramble created for Paul Dresher’s ElectroAcoustic Band. In a puckish bit of musical black comedy, Rolnick’s Seussian lyrics tell the story of Georgie and Dickie, two bullying boys who compel everyone to play by their rules or suffer the consequences. Rolnick embraces all techniques and influences at his disposal with irrepressible humour.